Kirsten Grind is a reporter for The Wall Street Journal. Much of the work for this book was done while she was a reporter for the Puget Sound Business Journal. Washington Mutual Bank, the once regional family-friendly thrift bank turned national mortgage lender, became the biggest bank failure in the United States in September 2008, at the peak of the developing economic crisis. 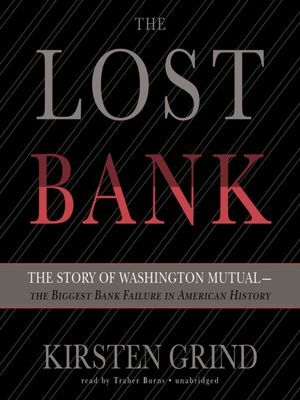 This book chronicles the events of the transformation of the once stodgy regional bank into the high-risk darling of Wall Street, to its final demise. Author Kirsten Grind tells her story through personal interviews, government records, and news clippings, bringing to life this modern-day tragedy. As the story unfolds, we get a glimpse into the folksy savings and loan under the direction of Lou Pepper, which developed as a strong player in the Seattle area in the early 1980s. We then watch the slow and deliberate changes that took place under new president, CEO, and chairman Kerry Killinger (appointed in 1991) until he was ultimately fired and the bank was finally closed by the regulators. 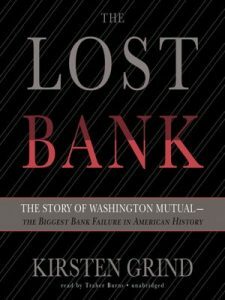 And while Killinger certainly gets much of the blame in his leadership role, other factors played a role in the demise of “WaMu” including his board, members of his team, the climate of the banking industry, the timing of the economic disaster, and the dealings of the regulatory agencies. A significant factor was the changing, drifting culture of the company. Under Pepper, the company established a culture rooted in human values focusing on four groups: customers, co-workers, community, and shareholders. “If any of these areas started to dictate the bank’s operation more than another, or if the bank overlooked any one group, that would signal a problem.” [5 percent]. Contrast this with the world as it developed under Killinger. “The corporate values remained in place, and had been narrowed down to the three main adjectives: Fair, caring, and Human. Killinger worried that affecting the culture might get in the way of financial results.” [Emphasis added, 10 percent]. In the early days, Killinger’s salary and bonus were less than $1 million, and he led the decision to avoid corporate jets. He and his reports strictly flew commercial coach — no corporate jets. By 2003 his salary and bonus were up to $4 million and he was the lone beneficiary of use of corporate jets that took him to personal, as well as business, appointments. He was given a severance package when finally terminated just a short time before the bank was closed, totaling about $22 million. Also paralleling Lay, Killinger seemed almost oblivious to the implications of his strategic decisions. Under congressional quizzing, he failed to recall any of the emails he had written regarding his strategy to go for higher-risk, higher-reward options. In a touch of irony, one of the cheerleading articles on Killinger (“Washington Mutual’s Remarkable Rise”) was written for Fortune by Bethany McLean in 1997, the same author who later wrote one of the definitive books on the downfall of Enron. Grind’s sobering, remarkable, well-written book would have provided a great case study for Jim Collins book, How the Mighty Fall. For Collins, stage one for failure is a “hubris born of success.” It is also a clear statement on what happens when the short-term economic factor becomes the dominant guiding tool for a business. Unfortunately, not much seems to have changed. The company that was picked by the regulators to take over Washington Mutual, J.P. Morgan Chase, has had some risk problems of its own lately. The case is documented, but is anybody listening? Perhaps if this fast-paced book becomes widely read, as it should be, there may be some increased call for change.